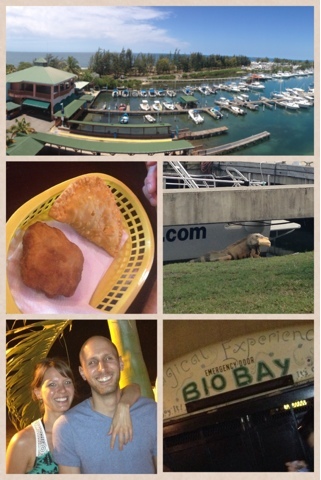 We explored the beaches and city center in Ponce. Ponce is the second most populated city on the island and is located on the southern part of the island. La Guancha Boardwalk, facing the Caribbean Sea, was beautiful - there is a marina, an observation tower and plenty of public space overlooking the water. This part of Ponce reminds me of the classic California beach town. There were restaurants and bars sprinkled throughout the sunny public boardwalk - it was clean, bright and well constructed. There were big pelicans that approaches us with no reservation and giant fish in the shallow water. We also walked through the city center which was lively with shops and restaurants galore. The architecture was detailed and painted in bright colors. We saw the old red and black striped fire station and the gorgeous Ponce Cathedral. We ate at a little cafe where we tried empanadillas, crescent-shaped turnovers - one filled with chicken and one with ground beef - and dumplones. We were impressed by the simple yet delicious food! Today we are off to Old San Juan and the beaches on the Northwest side on the island for some more great experiences!